Atlanta Food Trucks to Operate in the City? Atlanta Food Trucks: Is Public Right-of-Way Vending Coming to Atlanta? Atlanta City Council will be voting on the issue on March 17. The City of Atlanta is set to boost its mobile food service industry to new heights with an ordinance that is heading for a vote next Monday. The proposed ordinance will create a program that allows mobile food service vendors to set up shop in public parking spaces in limited locations around the City; new locations will be added to the program if initial phases are successful. The first phase of the program will occur in the “Government Walk” area of downtown. The area is home to the State Capitol Building, Atlanta City Hall, the Fulton County Courthouse, and other key government buildings; however, there are few food service operations in the immediate neighborhood available to serve the thousands of workers and visitors that can be found in the vicinity on a typical business day. The City will cap the number of Vendor spaces at just 18, at any given time – those spaces will be available from 7am – Midnight, each day, on a first-come/first-served basis. Vendors will be required to secure a Fulton County Mobile Food Service Permit from the Fulton County Health Department, a Permit to Vend on Private Property from the City of Atlanta, and a Business License from the City of Atlanta prior to participating in the program. In addition to the Government Walk neighborhood, the program leaders are also considering a future expansion into a number of city parks. Historic 4th Ward Park, Candler Park, Perkerson Park, Center Hill Park, East Lake Park, and John A. White Park are all expected to play host to Vendors on Friday Nights this Spring and Summer. The new ordinance will make no changes to the health permitting process, and Vendors will be required to secure proper permitting from the Fulton County Environmental Health Services Department – Central Division prior to making an application to join the new program. We will discuss the new program in-depth at our upcoming Street Food 101 workshop on April 5, 2014 at Prep ATL. The Mayor’s Office should be applauded for their efforts here – this could truly be a game changer for the mobile food service industry, and should add some much needed energy to the streets of downtown Atlanta. https://www.prepatl.com/wp-content/uploads/2014/03/food-trucks-atlanta-prep.jpg 511 838 doug marranci https://www.prepatl.com/wp-content/uploads/2018/09/PREP-LOGO_WEB.png doug marranci2014-03-13 16:15:582019-01-29 17:23:22Atlanta Food Trucks to Operate in the City? Hokulia Shave Ice Food Truck at PREP! 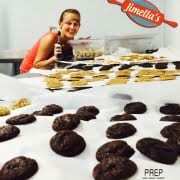 PREP's newest Baker - Jimella's Bakery!